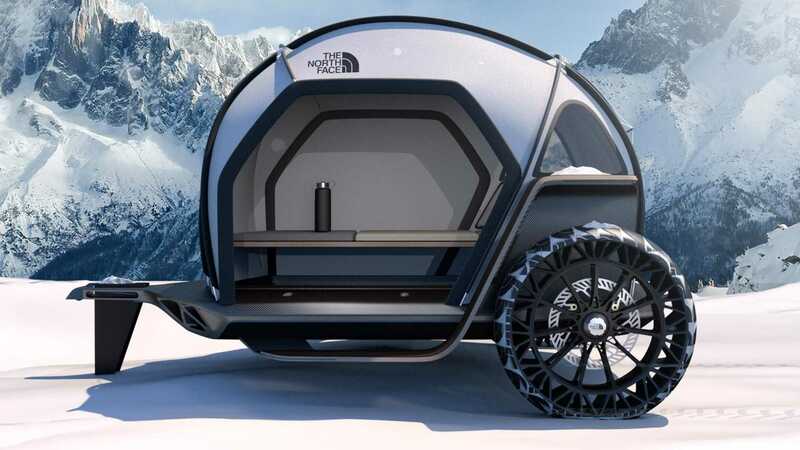 The North Face, synonymous with outdoor gear and adventure, has just taken a huge leap forward from outdoor-wear into technology, unveiling its brand new collaboration with BMW: The FutureLight fabric concept camper trailer. The soft shell camper trailer, the first of its kind to use fabric as an outer layer, was unveiled yesterday at the Consumer Electronics Show in Las Vegas. 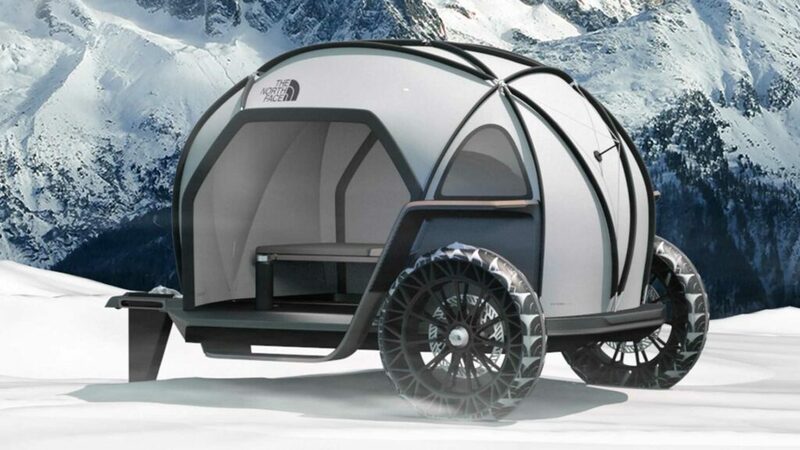 Designed collaboratively between The North Face and BMW’s Designworks, this trailer represents the future in outdoor living, and was designed to show that fabric isn’t just for clothing anymore. The camper trailer, as well as being extremely lightweight and futuristic, can protect from even the most extreme conditions. 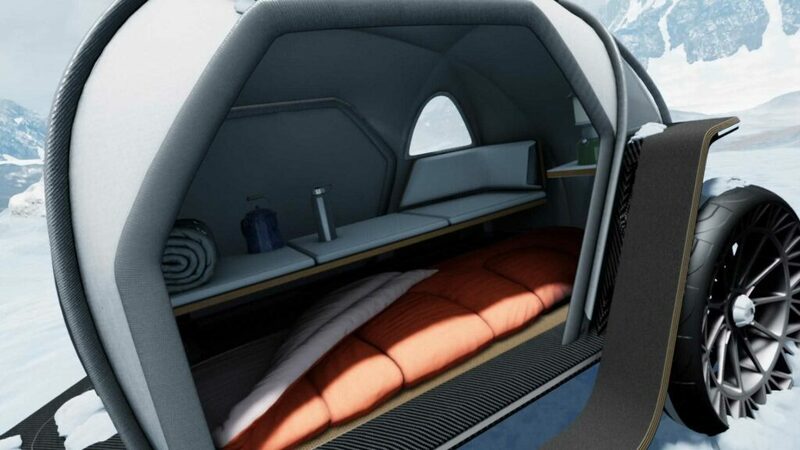 Inspired by BMW’s 2008 creation the Gina Light Visionary Model, the trailer contains the bare basics you would need on a sub-zero expedition, a bed and a shelf, as well as being particularly compact and cosy inside. While The North Face were busy working on the tent element, BMW contributed the motor and design aspects of the trailer. The iconic geodesic dome tent frame, which is made of carbon fibre, sits on rugged adventure-ready wheels, while FUTURELIGHT fabric is stretched over the entire exoskeleton. While there are few details about it so far, the two companies have explained that their new FUTURELIGHT fabric is made using “nanospun” technology, which is incredibly breathable with its millions of tiny holes allowing air permeability into the membrane, while remaining entirely waterproof. They also hinted that this futuristic new fabric will be available in a range of North Face products later this year. So with all this high end technology and innovation, what’s the catch? 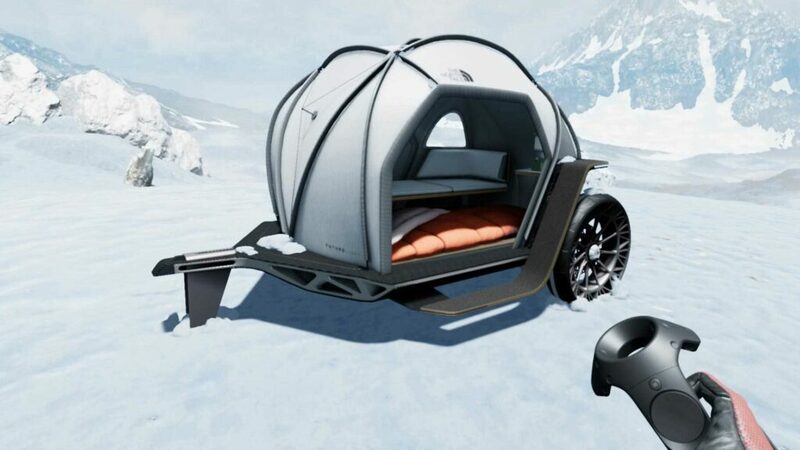 Well at the moment the FutureLight camper trailer is merely a concept, and is only available to view through a Virtual Reality headset at the CES show this month, showcased among some virtual reality snow and ice. However BMW and The North Face have promised that it will be available on the market later this year.